Faro is one of the most well-known cities in Portugal, situated in the Algarve region. With plenty of things to see and do, there are many reasons it attracts thousands of visitors every year. One of the biggest activities in this city is water sports and a visit to Faro will give you the perfect opportunity to give them a go! Diving is a must for those that visit this Portuguese city, even if you have never tried it before! There are plenty of schools and centres that will teach you the basics before letting you take the plunge. Under the water in Faro you will be able to see some of the most beautiful sights that this coast has to offer. Take pictures of the natural and man-made reefs that are teeming with wildlife, or just appreciate them from afar. 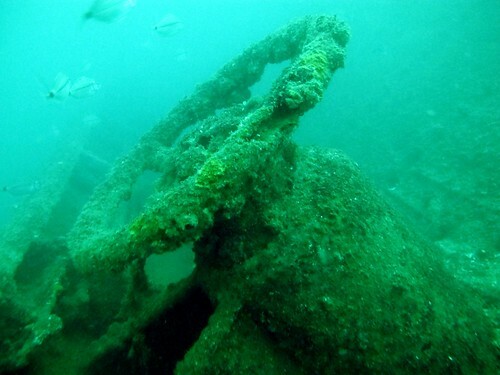 There are also several shipwrecks that you will be able to swim next to, or even through, when deep sea diving in Faro. The best diving companies will be able to take you to the exact locations and explain what these ghost ships used to be. You can also take an archaeological tour through the underwater world with trained instructors who can show you some of the most incredible things the depths have to offer. There are some truly fantastic sights to behold under the water in Faro, including shipwrecks and reefs! Those who would prefer to keep their head firmly above water may be interested in a whole range of boat trips and tours around Faro. You can take a peaceful boat trip to see the nearby islands of the Algarve, or try your hand at a bit of sailing instead. Some companies will let you have full use of a boat by yourself, or with a skipper, whereas others will take whole groups on tours throughout the day. You may pay a bit extra to have a private tour, but it is great for those with large families or couples looking for a more romantic experience. If you prefer a bit of an adrenaline rush then how about kayaking through the coasts of Faro instead? You can hire a kayak and be led by a tour operator through the seas to witness some truly incredible sights. Finally, those with a passion for sailing can also hire a boat (with or without a skipper) for a whole day! Take in the wonders of the Algarve and Portugal whilst sailing the beautiful turquoise sea. ñ Water skiing – Attached to the end of a boat and with your feet set firmly in skis. Take to the water as you would the snow and get ready for the trip of a lifetime! 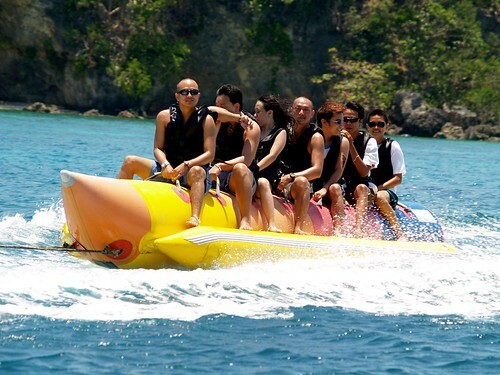 ñ Banana boats – This silly, but fun, water sport activity is great for groups of friends or the family. Each boat is in the shape of a banana and is pulled along by a speedboat. Just be prepared to fall off a few times! ñ Jet skiing – If you want to take control of your own speed then you can hire a jet ski in Faro. Up to two people can sit on a jet ski at any one time, so take your loved one for a serious thrill ride. You may need a few lessons before being allowed to take one of these out on your own. A banana boat ride in Faro can be a fun water sport activity for friends and family, just be prepared to get wet! Water sports in Faro, Portugal, are extremely popular. There is something for everyone, whether you want to get wet or stay dry! Take a dive into the depths of the Portuguese coast with an underwater camera for some spectacular pictures you will want to treasure forever. For those who want to remain dry then take a peaceful boat tour around the Algarve, or hire a jet ski for an adrenaline rush instead. Hire a car to get around to all the venues in Faro, save money now by clicking this link. There are a whole range of instructors, tour operators and centres in Faro that will be able to help you pick the best water sport activity for you and your group!